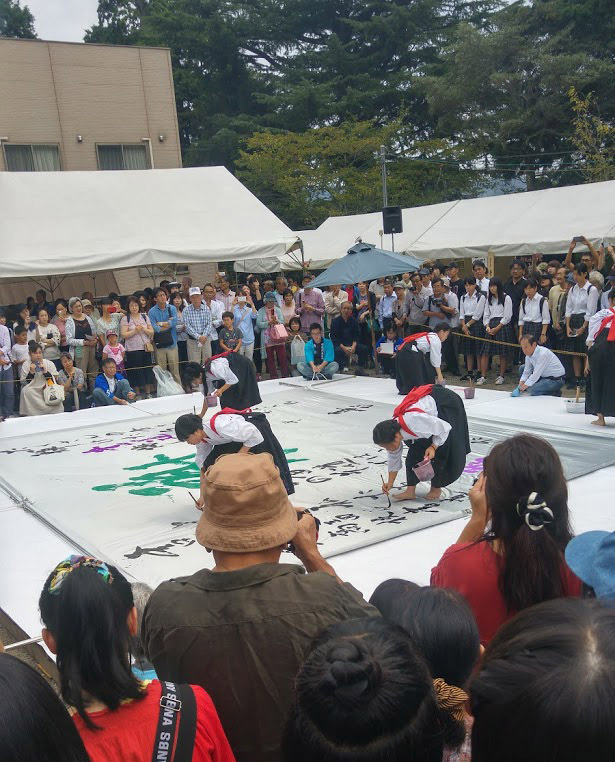 I had to quickly organize a trip to Japan in September, since the Fude Matsuri Festival was happening just around those dates I had to make sure I would be able to finally spend some time there. 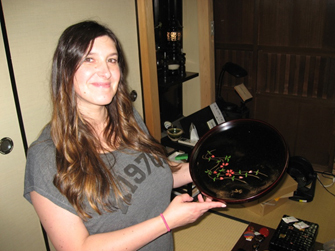 If you love Japan and brushes, make-up or calligraphy, it’s the place to be. All worked out perfectly and I was able to be there just in time for the time of my life! I shared some trip pics on Instagram and some of you wanted to know a bit more about my adventure. I quickly googled and organised some activities. For the first “tourist” day I booked a volunteer guide with Goodwill Guide on Kyoto Handicraft and Historical Sites. Please feel free to ask me any questions as I will not go into too much detail. If you go to their gallery, you can also see pics with me at work… gosh… I was tired and sad because it was my first big trip without my baby. 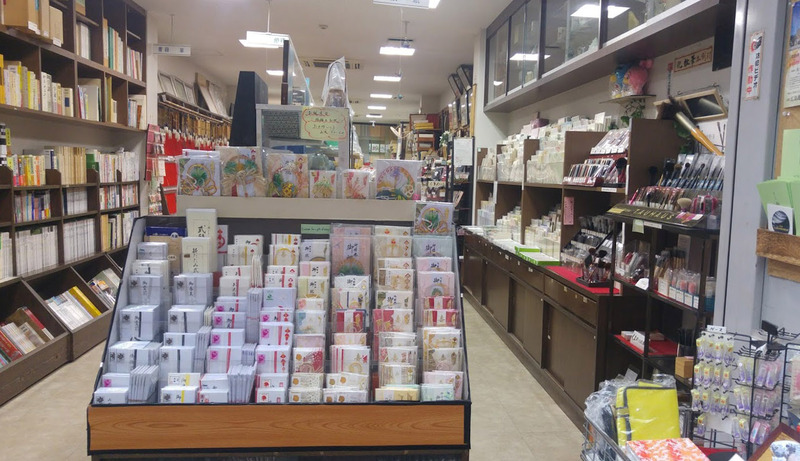 Our plan with my guide was to spend the day in Kyoto, visit the Handicrafts center (so many souvenirs available there and you can see the artisans in action). Then the handicrafts museum, the Orinasukan House to see the weaving performance for kimono fabrics and this Hirano makie workshop below. You chose a design with the artisan and you get to work!! I chose the wrong design because it was long and not the easiest, but eventually, I got there. You don’t need to have any particular skills to do this, it’s fun and you can ask as many questions as you want. I wanted to understand the technique, see how this was done from scratch, this experience was truly helpful. You leave with your drawing and the whole makie experience costs approx 40$.. I spent several hours there and I was alone with him and my guide, a private experience on top of that! I’d rather not do this alone, it’s much more fun with friends! 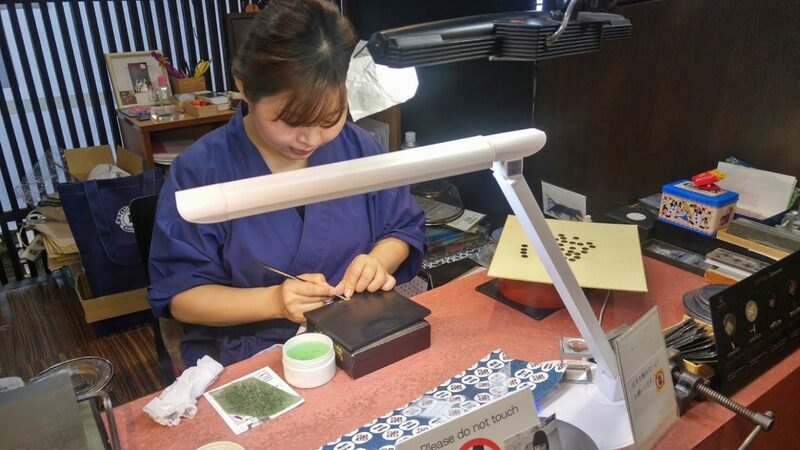 One of the crafts you can see in this Kyoto handicraft center is the Amita Damascene and how they engrave the jewelry. You can ask them any questions you have in mind and have a close look at their work. I spent a few days in Osaka, took the Shinkansen to Kyoto from Osaka when I had to go there. 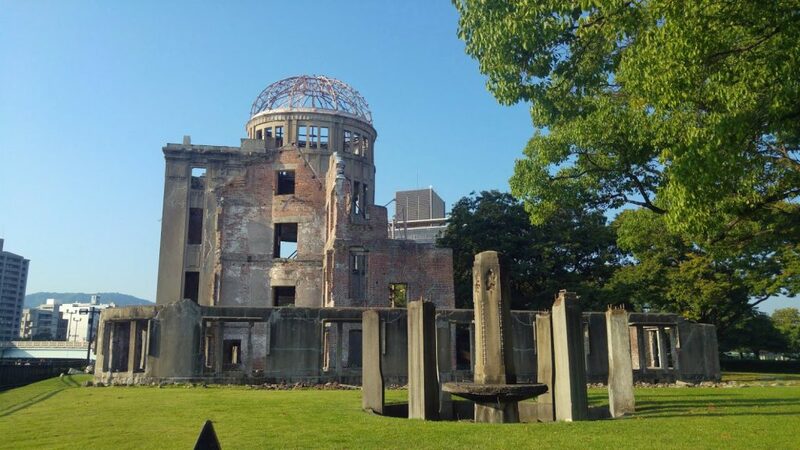 Then I moved to Hiroshima to visit my friends. 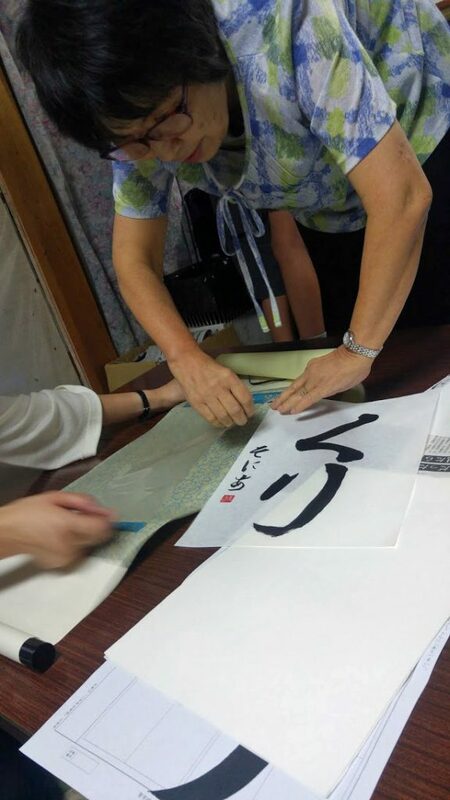 One evening I was with my friend and we took her son to calligraphy class, when the teacher saw me and knew how much I loved calligraphy, she wanted me to sit with her students and give it a go. Imagine my excitement… I was completely histerical! 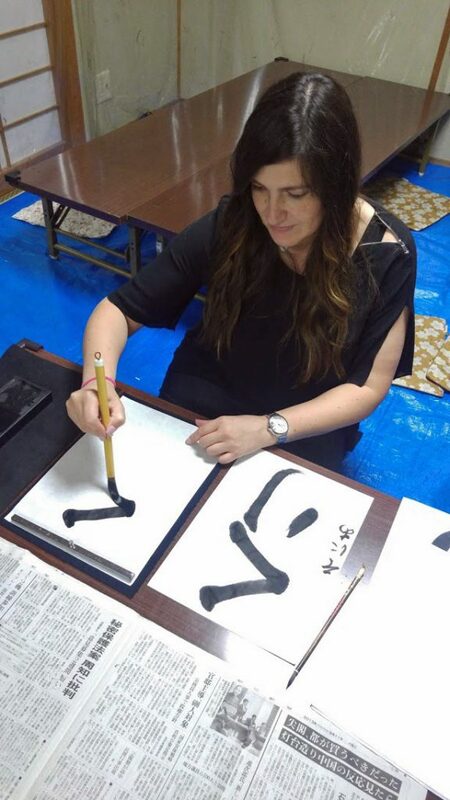 She made real ink for me (vs the one you buy in pots for the students) and gave me baby level calligraphy… for the first try she holded my hand while driving me, I could feel her energy, when to stop, when to put more pressure, it was mesmerizing. The teacher told my friend she could not believe this was my first attempt, she thought I was talented and special, my friend was happy .. I did not know what to say, I was so grateful for everything 😀 I was completely in awe of this amazing wise woman. She gave me a scroll and displayed my “art” in there for me to bring as a present and souvenir! I am writing a letter to this teacher today, to thank her for her kindness. This experience was not planned, it just happened and it was mind blowing. 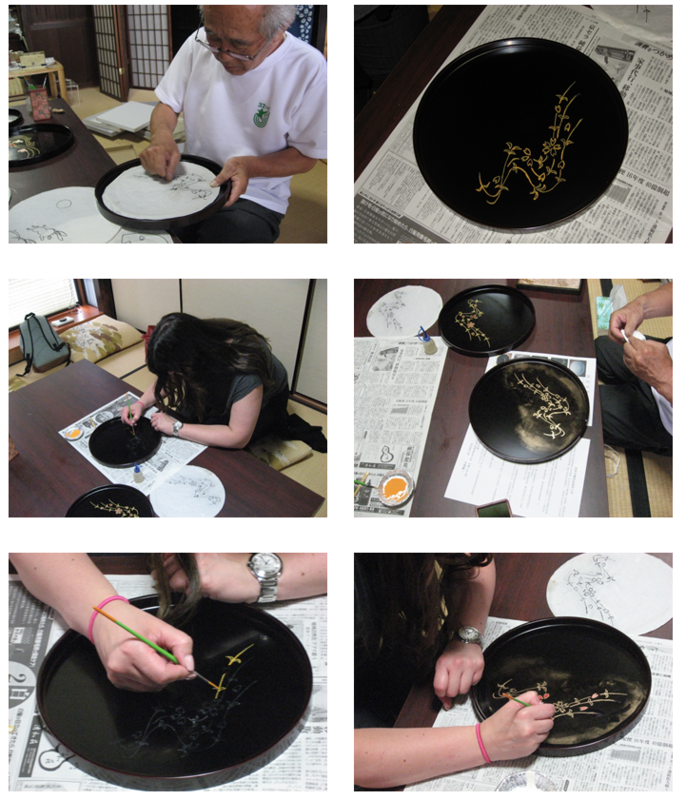 I will probably organise a calligraphy lesson if I return, if you love Japan and brushes it’s a great way to get in contact with both topics. 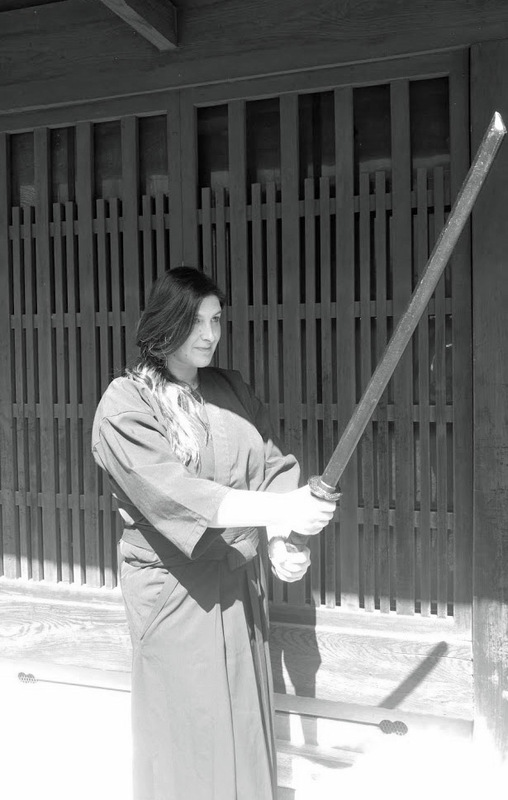 Another experience in Kyoto was the Samurai Voyagin , you get to train, then use a real sword and cut some bamboo like a pro. The part that was really of interest to me was the meditation, I had many questions about that. I know meditation is linked to creativity and they say when you are in the good state of mind your creativity will peak. I have difficulties resting my mind, getting a few tips was helpful! 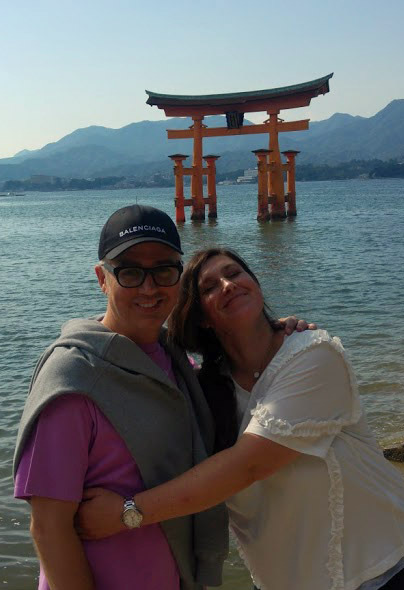 2,5 hours of Samurai life was so cool, for the next trip I will take my husband, he will love it. Costs approx 100 $ per person. The part where you cut the bamboo is so thrilling, at the beginning I couldn’t get the proper angle and strength, but just when the bamboo was much shorter and getting more difficult to cut it’s when I got it perfectly right, someone had just told me it could help to imagine “someone” in particular being that piece of bamboo, that was funny and apparently worked for me. 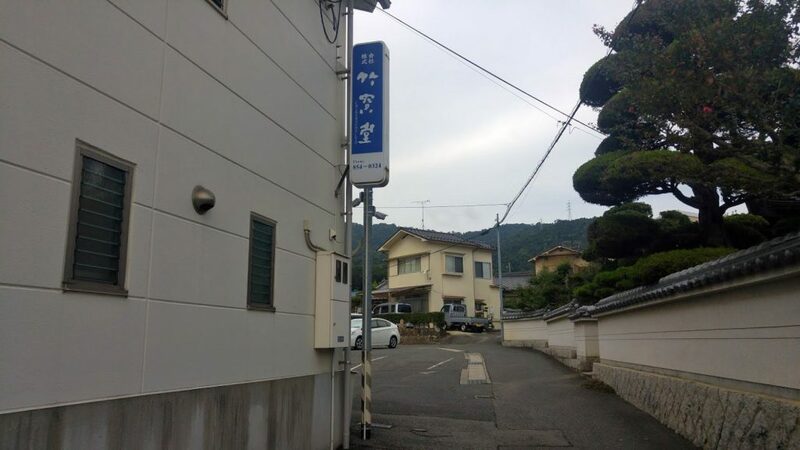 And now we are approaching Kumano… first stop was at Chikuhodo’s manufacture. Had a peek at the new Kiwami, did not get it as I already have the old set but was happy to see it in person. Two of the brushes are a bit different so I managed to split a set with someone else and get me these different two! 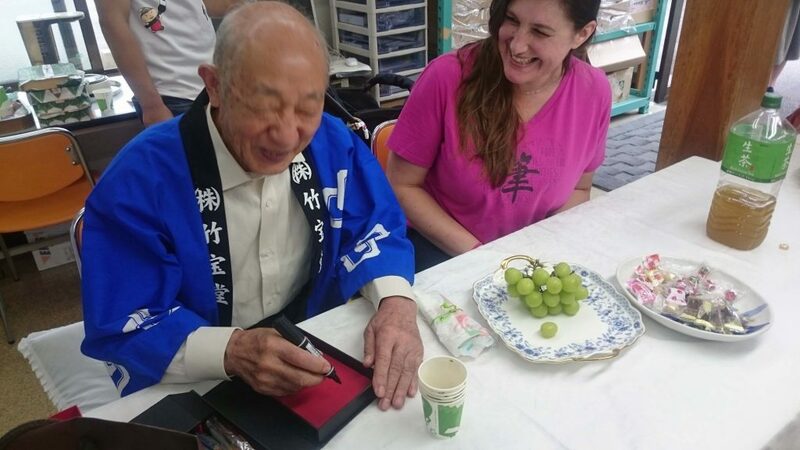 Mr Tesshyu Takemori, Chairman of Chikuhodo and creator of this set was autographing it for my friends and we had so much fun, you don’t often see him having such a laugh right? It was party day! The athmosphere on the Festival day is something else. 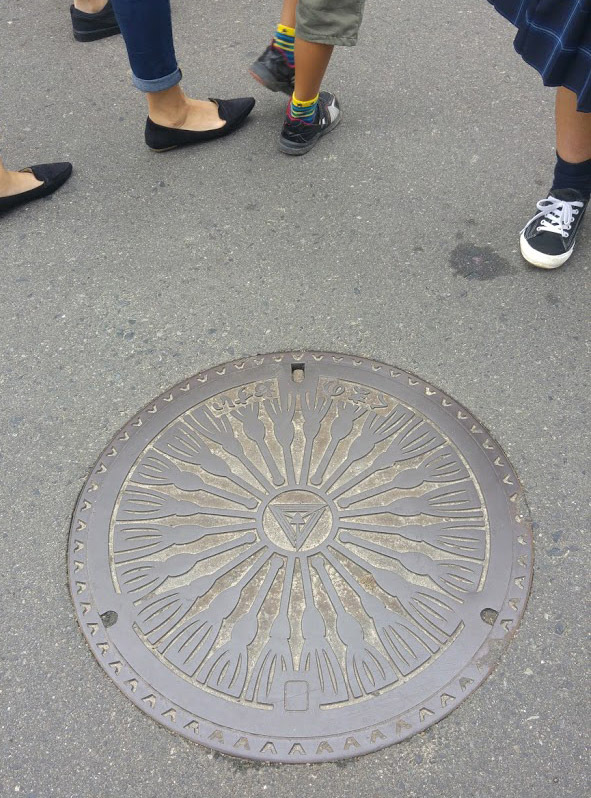 When you walk on the streets of Kumano, have a look at the sewers… how pretty these are! 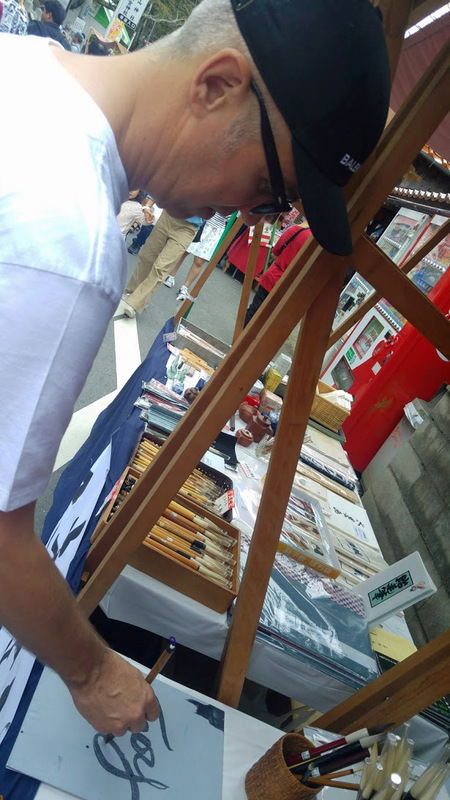 And here I am at the Fude Matsuri, brush festival, happening once a year on the Autumn equinox. 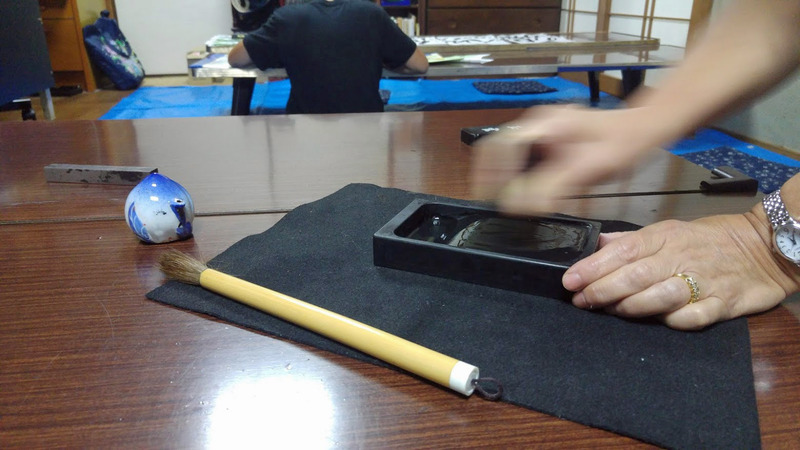 If you are a brush lover, make-up or calligraphy and want to know more about this and spend some time with the artisans, this is a mandatory visit. Actually I will do anything I can to attend as many as I can. Already planned to be there next year. 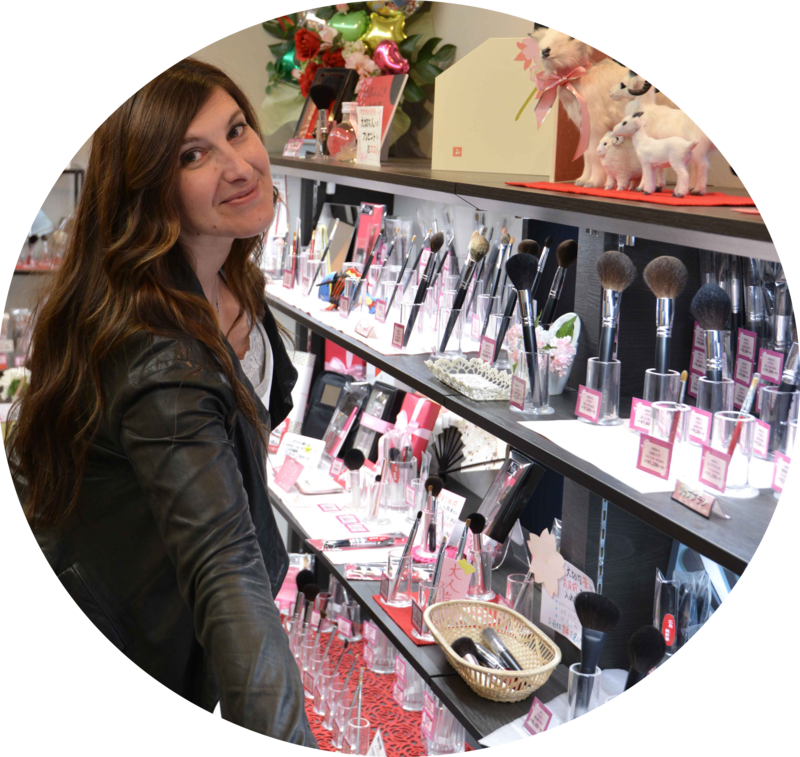 You have many counters with brushes, sometimes they have “outlet” sections, brushes that have a little scratch will be a lot reduced. What you don’t know is that behind the counters are often the Presidents of the companies because this is local and family business. I know some of the Presidents personaly and while walking I could see them working there, Mizuho, Tanseido, Chikuhodo and many more. I got there around 10h30 and left around 2pm. 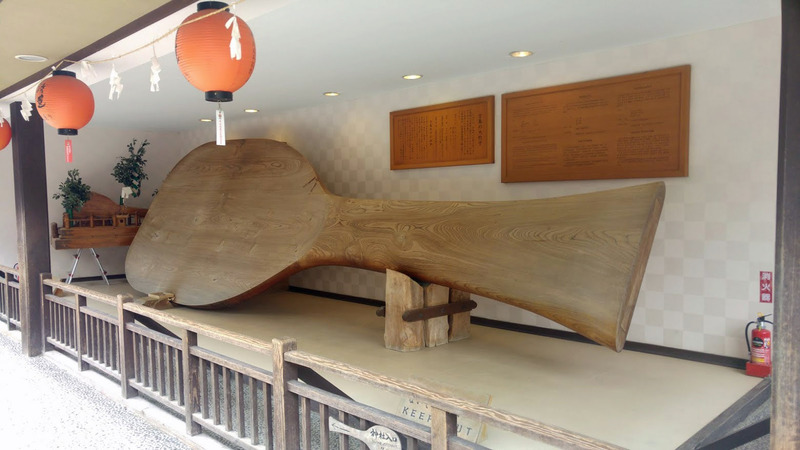 I had to go visit and spend some time with other Kumano friends so I could not stay that long but next year I will go before the opening and stay until the very end!!! I enjoyed it so so so much! This choregraphed calligraphy dance was out of this world, the colors and the atmosphere was stunning. 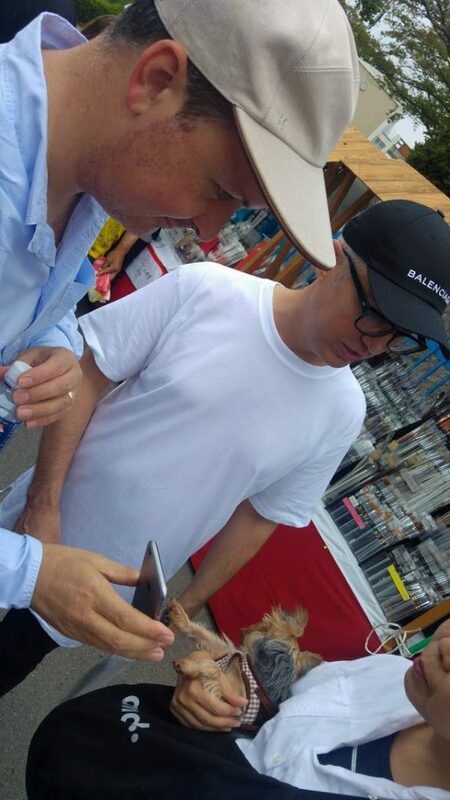 I met Troy Surratt and Nathaniel by accident when I arrived and I stayed the whole visit with them, I could not believe it, I was finally there at the Festival and with Troy and Nathaniel!!! I had no idea this would happen, we had been chatting on social networks and were trying to meet but I don’t travel that much and he is always on the move, this was the best timing ever. We sticked together, got to know each other and had the best time speaking to locals, browsing the counters, eating, chatting about everything. I am so proud to be able to say I have two new friends, so special and so lovely. Troy tried some calligraphy, I quietly captured the moment and was mad because I thought I had lost this pic. My phone was not working well that whole day and had left my heavy camera at the hotel. So happy I managed to sync and find it. It’s a busy place but peaceful, calm, happy, you can enjoy the counters, talk to anyone. I did not hear many foreign languages but mainly only Japanese, I don’t think there are many tourists there but I could be wrong. 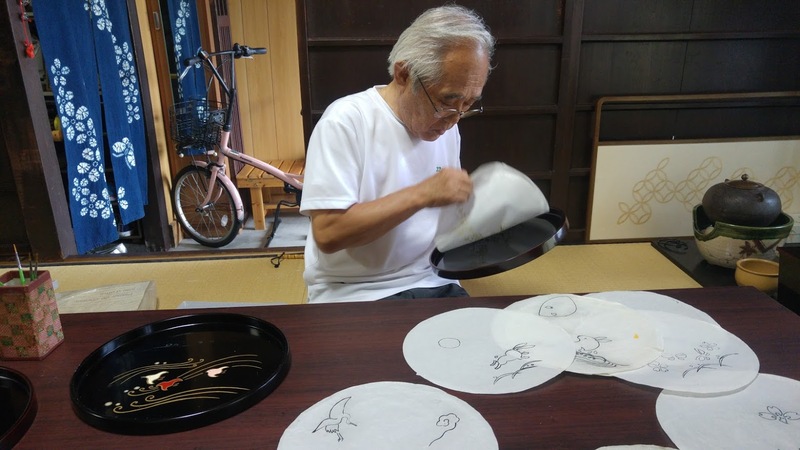 There are so many things to do brush-related, we admired the artisans performing, engraving, making their own paper. Eating was also so exciting 😀 See those fries? 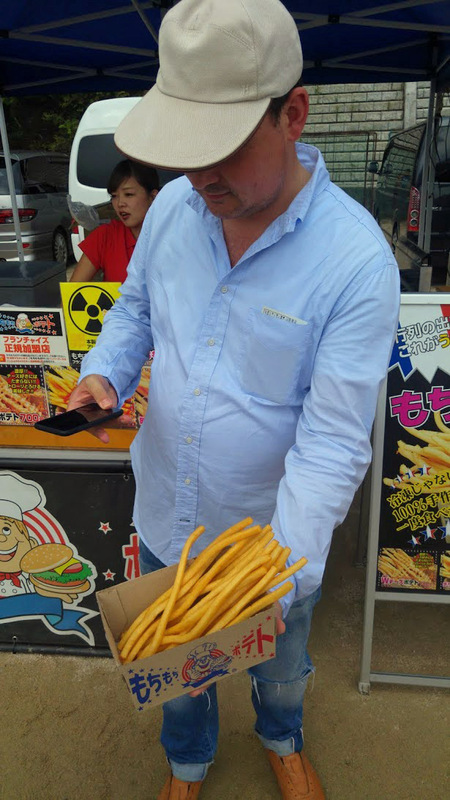 they are DELICIOUS! Don’t miss them. 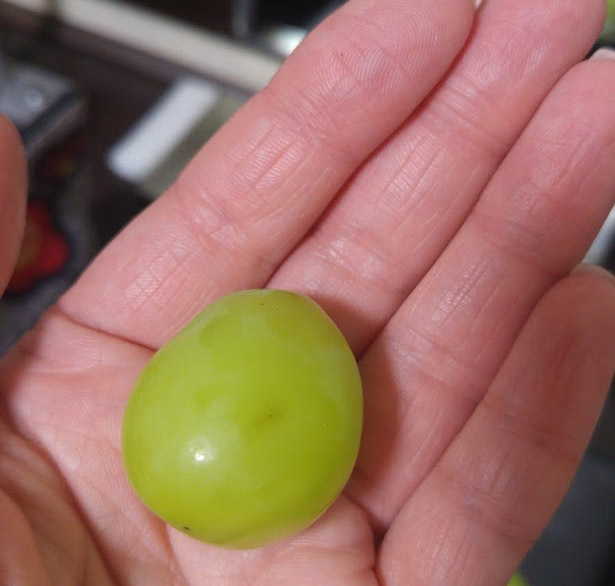 I told Troy and Nathaniel “imagine the size of the potato” when they told me these are actually reconstructed potatoes… . Don’t miss the local lemonade either! Actually just try every single thing. 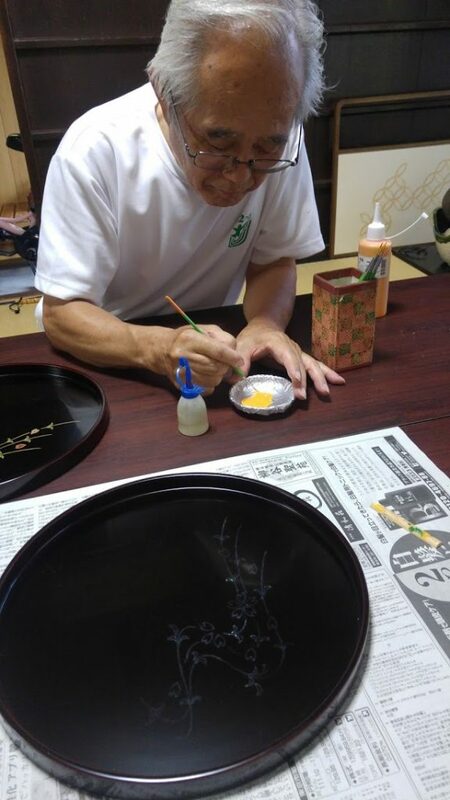 For the next Fude Matsuri visit, I will go as early as possible to make sure I can try every dish and spend more time with the artisans. 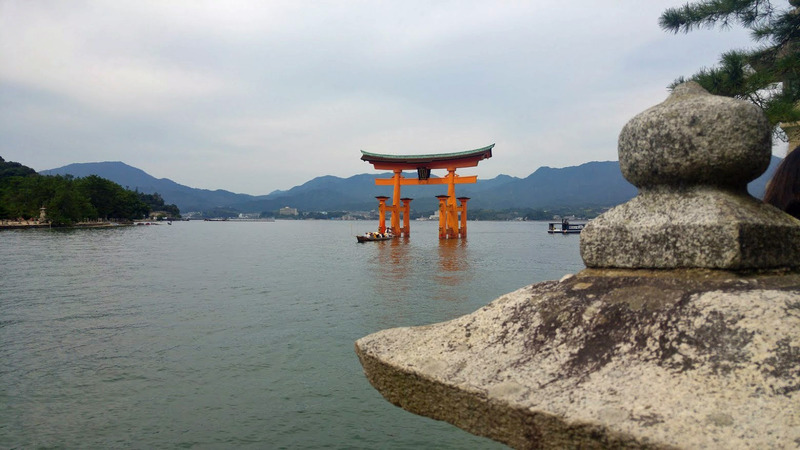 The Sunday I wanted to return to Miyajima, Troy and Nathaniel said they would join me there. 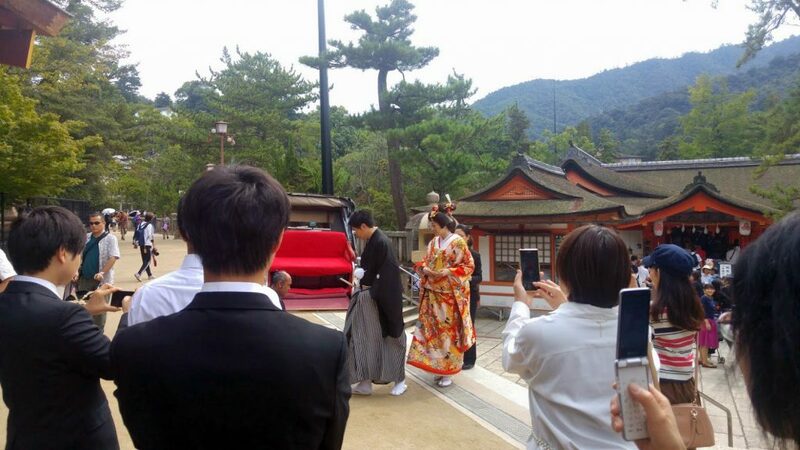 A traditional wedding on the island. Time for some pics, I had so much fun with Troy and his partner Nathaniel, I still cannot believe it today! I will never forget the great time we had together. 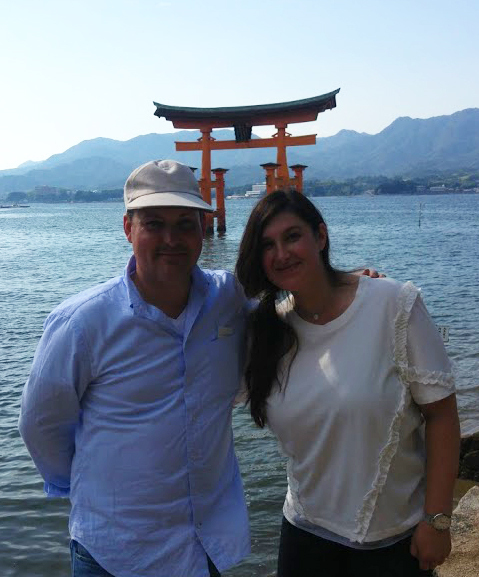 On Sunday, after Miyajima, we returned to Hiroshima with the high speed boat, we did some sightseeing, I cannot believe we managed to find a Kashoen brush reseller by accident so we also did some brush shopping, souvenir shopping and then we had Okonomiyaki for dinner, such a perfect day! 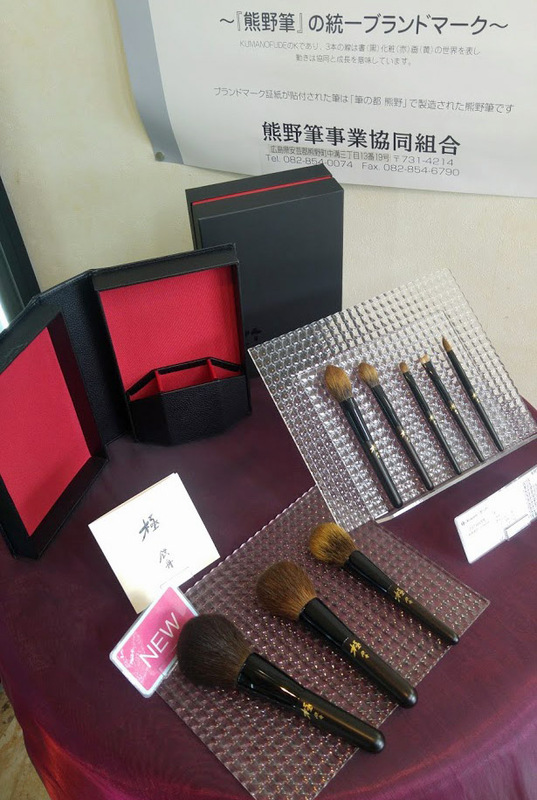 Again, if you are a brush lover, there are several shops in Hiroshima were you can find brushes, make-up or calligraphy, unfortunatelly you often find the same brands but it’s the best moment to see and try them for yourself. JAPAN 2017 TRIP AND THE FUDE MATSURI was last modified: October 16th, 2017 by Sonia G.
Hi, I have been following your blog for years now, and thanks to you, I got my very small collection of Japanese brushes. Nothing very fancy, but I use them every day and I love them. I am planning to go to Japan next year with my partner on holiday, as I’ve been in love with the culture since I was a kid so this post is so very helpful. I would love to visit a Brush Manufacturer however I am not really sure how to do it…will read again your posts. Maybe you also have some recommendations on places to visit? To be fair, my generation grew up with Anime and Manga (I’m Italian, living in the UK) so surely this had an influence in my interest for the Country and its culture. 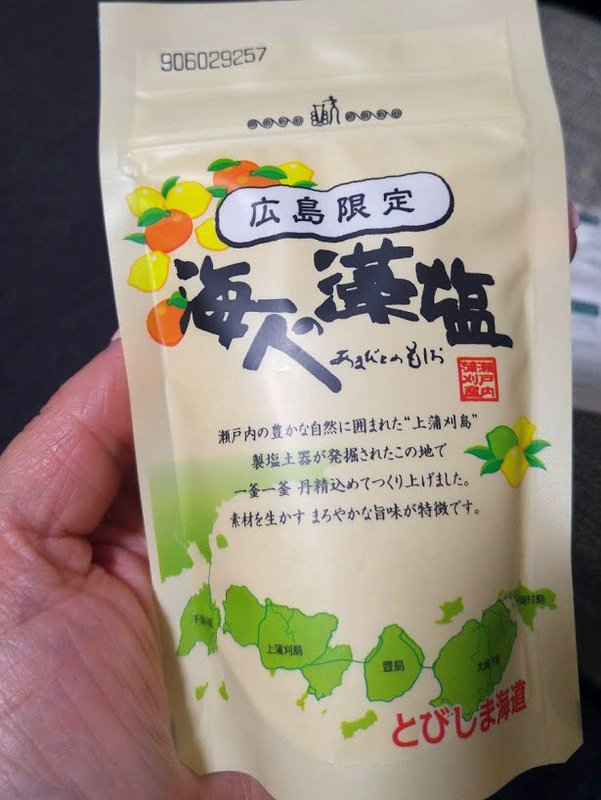 Are you going to Kumano? let me know where you plan going and I will try to give you some recommendations 🙂 we could have a quick skype call if you want. What month are you there? 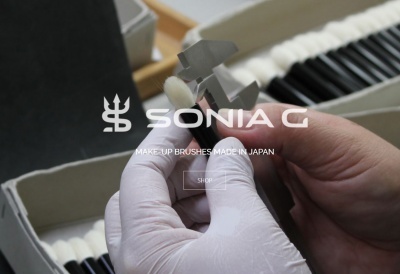 Reg the manufacturers, depends on what brushes you love most, maybe it’s more exciting to visit one that you truly admire ? hi Sonya, I love love love read your blog, it gives so many information. as I read it a lot, I started to develop my love for Japanese brushes although I don’t have it (yet). I’ll graduate from make up collage on November, and will start to be a freelancer mua, I really want to buy great brushes for that and my self. but the more I read your blog, the more I want to have them all haha. I know how it starts, there are so many to chose from!!! Do you already have a brand/budget/type in mind? 🙂 what were you using so far? if you have some I can suggest higher end dupes for example… not sure what you need and what type of looks you would be working with the most. I don’t have budget actually, want to buy good brushes that can help the application of make up. Mine is from the collage and it’s local brand, sheds really bad, and not help enough blending. that’s why I really need brush recommended. haha. i’m eyeing it cosmetics, Wayne Goss, chikuhodo, and hakuhodo. I need a full set of brush (but I don’t mind to buy indivually, because I know sometimes one better than other in different brushes). you tried so many amazing brushes, and just want to know your favorites, like eyeshadow brushes (crease, lid, outer v, highlight, brow), foundation brush, cream blush and cream contour highlight, blush, face highlight, bronzer, contour, powder (loose and foundation powder). that just overwhelmed me Sonia hahahahha. 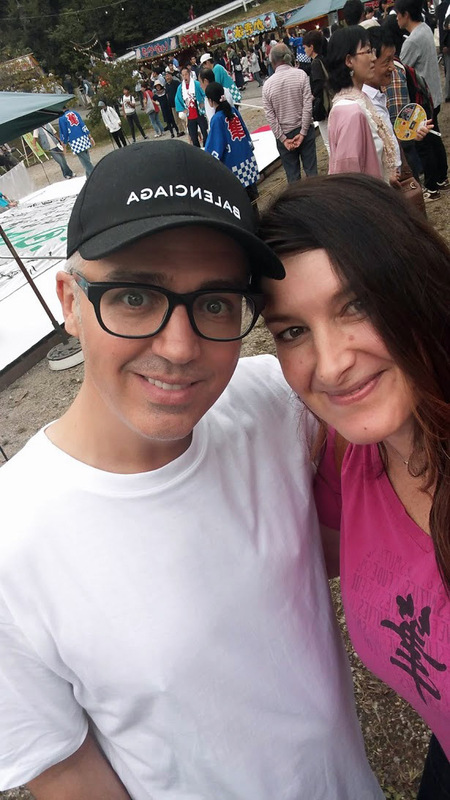 many thanks Christina, this really makes my day 🙂 sending you big hugs from Switzerland! Thank you Sabrina 🙂 my pleasure !! It’s amazing what you can do now, the samurai is a must-do! I hope you’ll go there and you do something cool too!! I read your blog posts about Japanese brushes frequently. I am in Kyoto for a couple of months. I went to the Hakuhodo shop and bought some brushes, several of which you rated highly. Thank you. 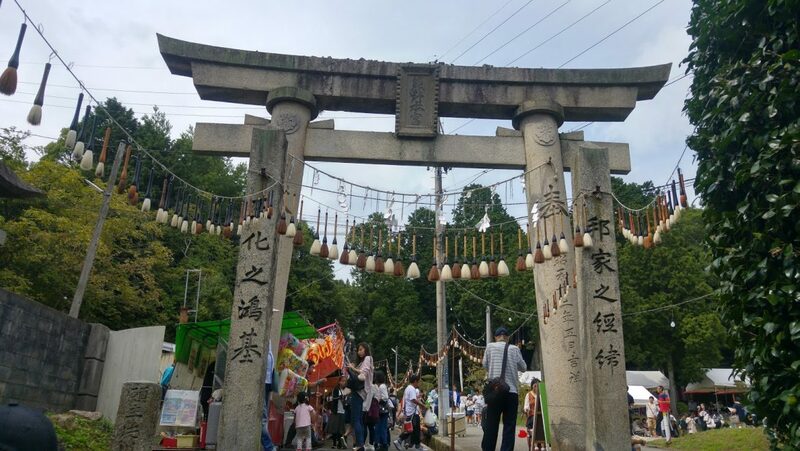 I had no idea about the Fude Matsuri. Next year . . .
Next year I will really do my best to be there so keep me posted if you do! Fantastic post!! I will try to visit Kumano the next year. For sure I will ask you for recommendations 🙂 I am happy for your fabulous experience… and with Surrat?¿!!! INCREDIBLE!! Thank you Raquel, it was just amazing! let me know if you go!